Gorse is from the family Fabaceae. All the members of this family can extract nitrogen from the air with the help of special bacteria. These bacteria from the genus Rhizobium and others transform the nitrogen from the air into a form of nitrogen that can be used by the plants. 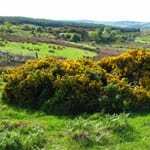 A gorse plant contains 2-4% of flammable oils. 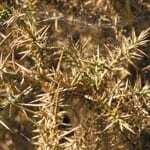 At the core of the shrub is plenty of dry and dead material. During a warm and dry summer, gorse burns easily. 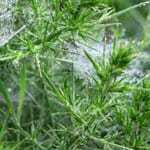 Gorse is an evergreen plant with spiny branches and trifoliate leaves with thin spine-like leaves. This protects the plant from drought, because such leaves don’t lose much water. 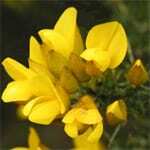 Gorse is one of the earliest of our trees and shrubs to flower. The intense yellow flowers normally appear in March, but may be as early as January. They resemble the flowers of the pea and exude a smell similar to coconut. The seeds are borne in pods which burst explosively in late summer. The pods are brown or black and slightly hairy. The seeds remain viable for up to forty years. Germination is aided when the seeds have been exposed to high temperatures. Gorse stems are stiff and grow closely together. As such, the plant forms a very dense shrub. 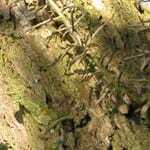 The bark is light, sandy brown, deeply ridged when old. 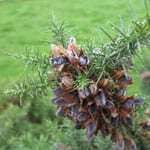 Gorse prefers mild winters all year round. It grows well on poor, dry, sandy soils in coastal areas, near sand dunes, on wasteland or disturbed sites. As it tolerates acid soils you can also find it in drier heathland. It is very often used in hedges.